Full Shark Tooth Chain (100% shark teeth). PTO shaft-drive with heavy duty slip clutch for overload protection. Gearbox drive with chain reduction to the headshaft giving productive digging chain speed. 24 in. 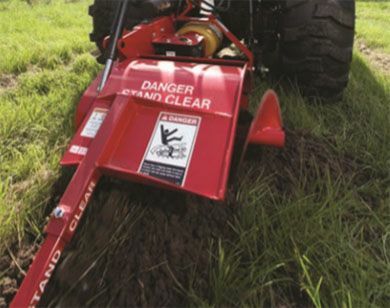 discharge auger, places dirt well away from the trench. Several tooth options available cup, shark, rock & frost. 50,000 lb., 2 in. anti-back flex-chain. With 4 ft. boom - 96 in. 3-point length to headshaft - 24 in. Chain width - 10 in. Headshaft height (auger at grade) - 12 in.